Pratt finished just 4-5 last season and entered 2016 unranked. 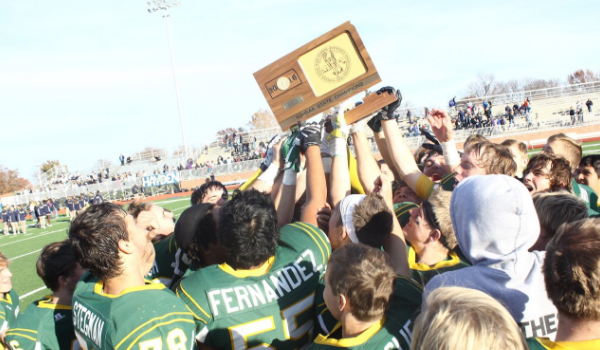 The Greenbacks put together a 12-1 season and won the 4A-II state title in dominating fashion with a 48-14 victory over Topeka-Hayden in Salina. Hats off to Jamie Cruce and the turnaround as the Greenbacks got their first state title since 1995. Clark led Derby to its third state title in four years and a back-to-back title in 6A this season. Clark has three state titles as the head man at Derby and has established himself as one of the best coaches in Kansas. The Panthers beat Blue Valley 17-14 in this year’s 6A state title game in Emporia. Vang led Goddard to a 10-2 record this season and got them into the state championship game for the first time since 1988. A lot of credit needs to be giving to Vang, especially with Goddard splitting into two schools a few years back to make two 5A’s (Goddard & Goddard-Eisenhower). Goddard lost a heartbreaker in this year’s title game in double OT, 35-34, to Mill Valley in the 5A state title game in Pittsburg. Stallbaumer led Basehor to their first ever sub-state title appearance in school history this season. Although they didn’t see the result they wanted with a large deficit loss to Miege in the semis, Basehor-Linwood football has been put on the map with Stallbaumer, now in his third season with the program since coming over from Lyndon. The Bobcats finished 11-1 this season. Stallbaumer is 24-9 in three years, the year prior to him getting there the program went 3-6. He has the two farthest runs in the playoffs in school history (2015, 2016). Pratt finished just 4-5 last season and entered 2016 unranked. The Greenbacks put together a 12-1 season and won the 4A-II state title in dominating fashion with a 48-14 victory over Topeka-Hayden in Salina. Hats off to Jamie Cruce and the turnaround as the Greenbacks got their first state title since 1995. Cruce was once a college head coach at NAIA Bethany College in Lindsborg, Kansas, prior to taking the Pratt head job in 2013. After starting out the season 1-3, Hesston put together one of the best seasons in Kansas. The Swathers would go on to win 10 of their next 11 before falling 48-42 in OT to Rossville in the 3A state title game in Hutchinson. Rider took the program to its first state title appearance since 1992. He is 36-9 as the head coach of the Swathers in four years. At just 29 years old, he is one of the top young coaches in the game. Jasper, a native of Troy and former all-state player himself, in his fourth year with the program, led the Trojans to their first state title in school history with a 28-24 victory over Plainville in Hays. He is 40-8 as the head man of the Trojans and has the three deepest runs in school history, two title appearances (2016, 2015) and a semifinal appearance (2014). Jasper served as the junior high coach for the group of seniors that captured the school’s first ever football title and got 40 wins as a group in four years. Osborne went a perfect 13-0 this season as they defeated St. Francis 38-24 in the state title game. First year head coach Cullen Riner, who was also a co-head coach with Steve Tiernan a couple years ago, took a program that went 4-5 last year to a perfect season. Heuer led the Wildcats to a perfect 12-0 record this season in capturing the 8M-II title over Dighton, 68-22 in Newton. Hanover took second last season in 8M-I. The most impressive thing this season was not the offense of the Wildcats, but the defense, as the allowed just 72 points all season, an average of just six points per game.